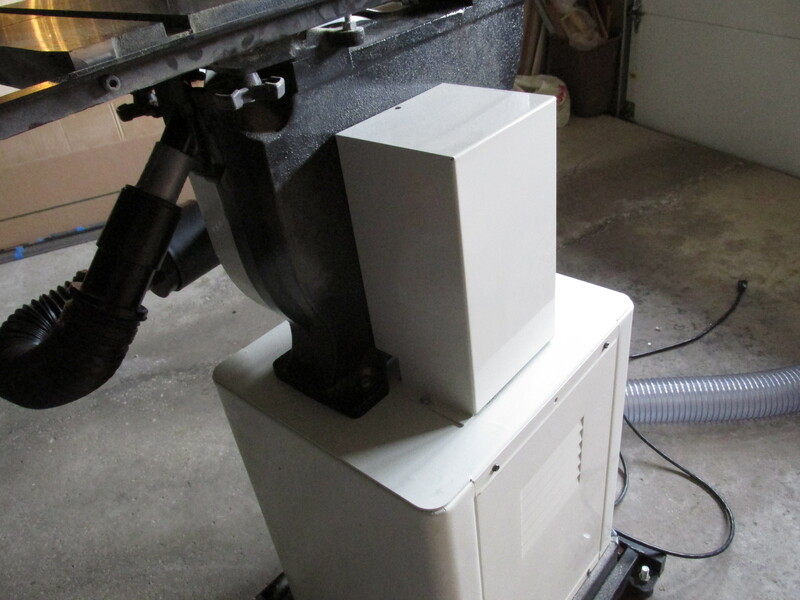 Late last year I decided to invest in a real dust collection system for my shop. 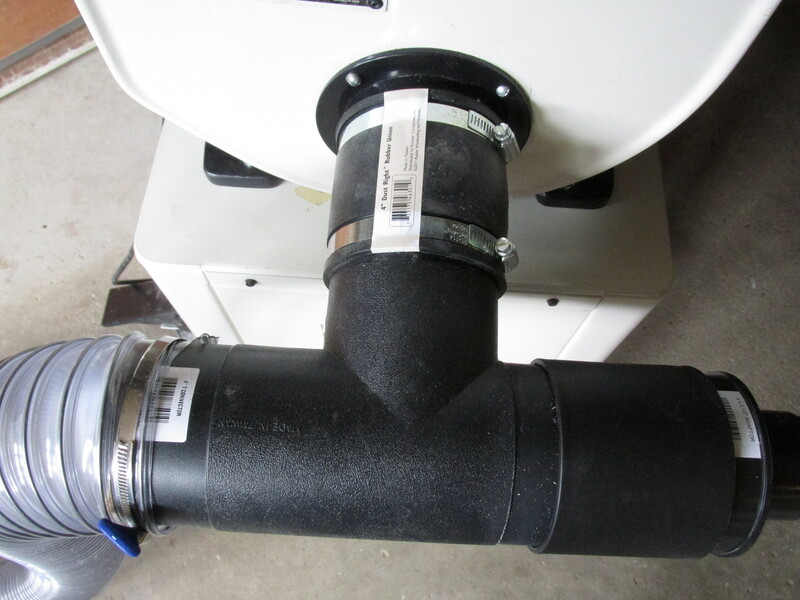 Unfortunately my shop is too small for a REAL dust collection system so I just bought a Jet DC-1100VX-CK with a 4 inch hose port. It’s on a wheeled base and, despite its steep price tag, still can’t roll over its own cord any better than the numerous vacs I’ve owned. 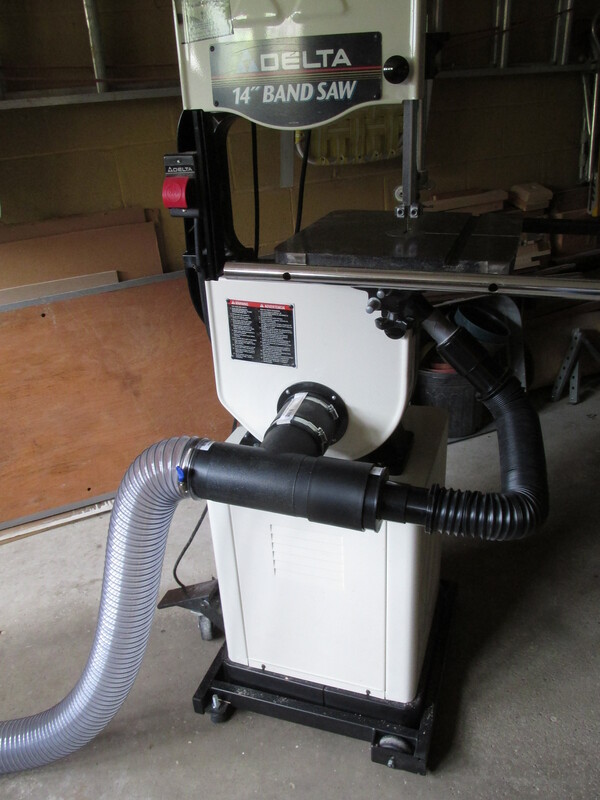 My old Ridgid shop vacuum just couldn’t do the job and my table saw already had a 4 inch port for dust collection. The new equipment works very well when attached to the table saw. I also have a Delta 14 inch bandsaw. I attached the DC-1100 to the existing port that came with the bandsaw using several connectors to get from 4 inches down to 1 and a quarter inches. I never felt the port was engineered or sized well enough to do the job but was confident the DC-1100 would be strong enough to help justify its cost and carry the dust away. That would have been too easy. The poor placement of what is basically a hinged flange next to where the blade passes through the saw table has open space all around it. Dust continued to collect in the chamber that holds lower wheel even when connected to the Jet. Dust also escaped from various openings in the cabinet including around the port. At that point I felt the 4 inch system was no better than my old vac. Google was my next resort. I found several people that were trying to solve the same problem with their bandsaw. I never knew there were so many variations of 14 inch bandsaws. No one with a solution had my exact configuration. The closest one opened a 4 inch hole in the back of the cast iron housing that protects the lower wheel. I was all set to do the same when I discovered a metal box covering the drive belt blocked access to my cast iron housing. My only choice, if I wanted a 4 inch port, was to locate it on the door covering the lower wheel. I used a 4 inch plastic flange as a template to draw a circle on the lower door. I drilled several holes inside the circle being careful not to damage the wheel. I used a reciprocating saw with a hacksaw blade to remove as much of the metal as I could. Actually I stopped just short of ripping my wife’s arms off as she held the door. I left the door attached to the housing with the hinge as I cut the metal. 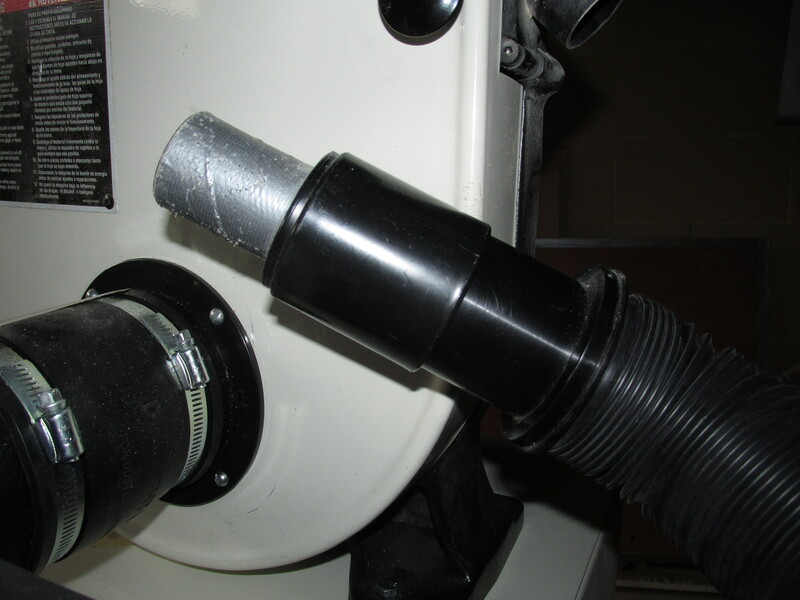 I then used my hand drill with a small grinding stone on a shaft to remove more metal closer to the drawn circle. 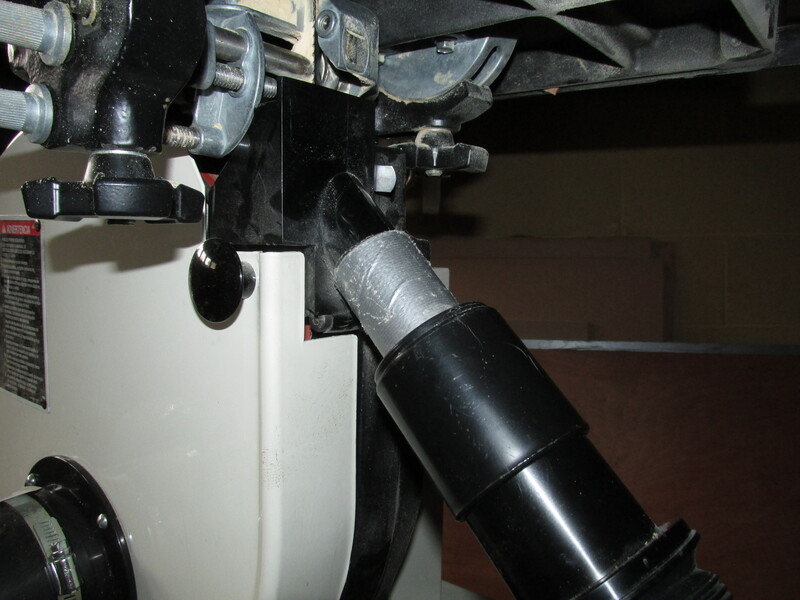 It wasn’t perfect but I basically had a 4 inch opening with a rough edge that is hidden by the plastic flange. You can see, in the pictures below, I was able to incorporate the original bandsaw port with the new 4 inch port. The combination of the two ports do a much better job of collecting the dust. The finer particles are carried away. The dust that is not drawn below the table by the blade, still collects on the table but all in all I’m satisfied with the new arrangement. 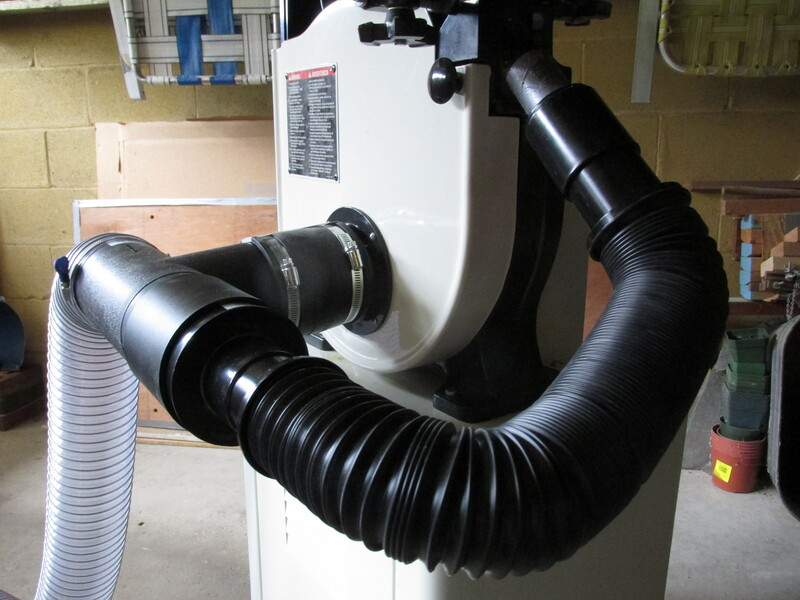 This entry was posted in Tools and tagged band saw modification. Bookmark the permalink.